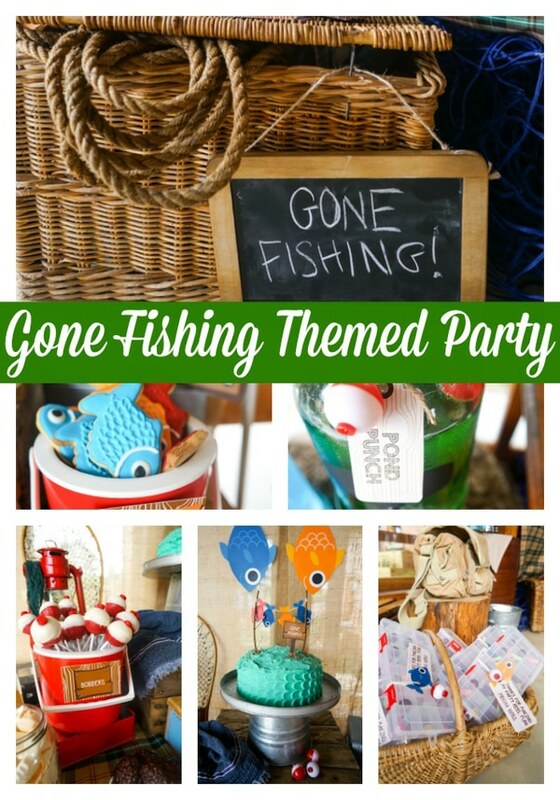 This fun and colorful Adorable Boys Gone Fishing Party would make any little angler squeal with delight! From Sunshine Parties: Boys and fishing rods … it seems that they are born wired to have a life-long love affair with them! 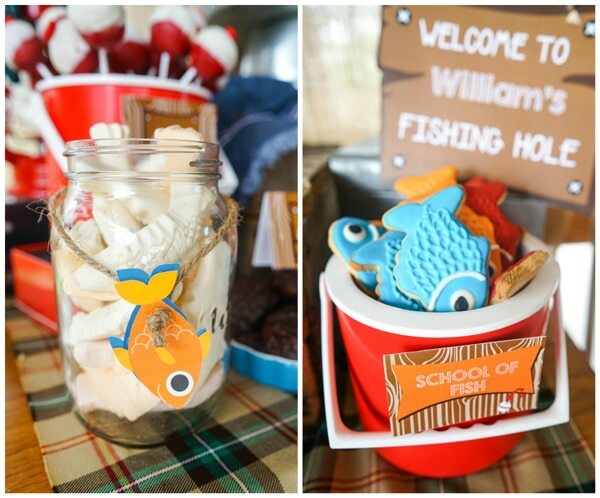 William (my middle baba), has a particular affinity for all things fishing, so when it came to his 4th birthday, I knew he would love a “Gone Fishing” themed party … So here it is! William LOVES fishing!!! Sunshine Parties designed the invitation and set (containing the editable printables needed) which added to the decor of the party. Note the fishing bag and wooden log in the background – when setting up a party always remember to raid your cupboards and search for anything that could possibly go with the theme. It is amazing what you can find. And if your stash is a little dismal, raid your best friend’s cupboard – she’ll understand! I set the adult table up with sweet/savory tarts, cheese platters, ice tea and lots of flowers. We got a school of fish sugar cookies made, which looked very handsome when placed in the red cooler. The kids devoured them, naturally! 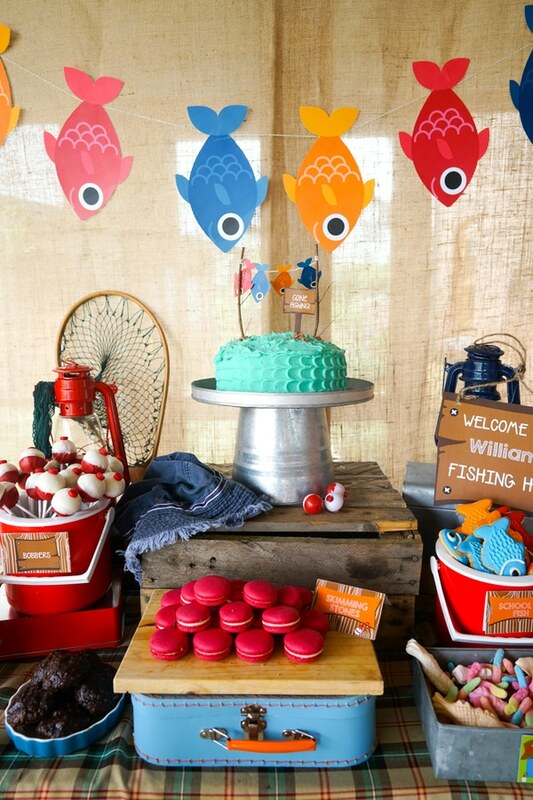 When I first decided on doing a fishing party and had been given the thumbs up from young William, I had a little terrified moment where I thought, what on earth am I going to do for the cake??!?!? I can’t do fondant fish or boats or anything fancy so I went with something over-the-top simple. You can never go wrong when you keep things simple. I made a delicious chocolate layer cake and then tried this frosting technique on the outside (with the help of my party pal Cath) – which may look like waves or scales, the interpretation is in the eye of the beholder, so I’ll leave it up to you! I tried to make the top look like waves and the mini bunting and cake topper sign worked well to add a little color and fun. I used chocolate shavings for the “sand” around the sticks. 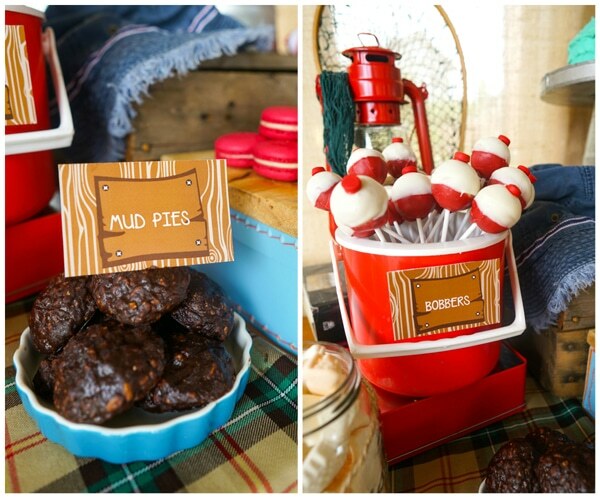 There were also Mud Pies, Cake Pops, Marshmallow Fish & Sour Worms. FUN! I bought some blue sports juice and diluted it with water to get this pretty blue “lake water” color. Those are plastic goldfish at the bottom just in case you were wondering! 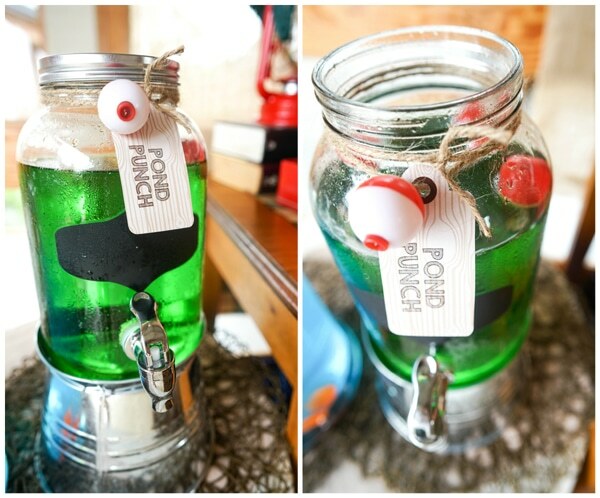 And then we have pond punch with its characteristic green color. Again, I just bought some green juice, diluted it with water and decorated it with red and white floats. I chose a small table again for the party – small tables seem to work best as the decor fits well and you don’t have to load the table up with too much cake and candy. I used an old wooden crate to create height for the cake as well as a galvanized cake stand that my friend, Taryn, made for me. Other table accents included lanterns, fishing nets, a printable sign, tin boxes, red and white floats and red coolers. 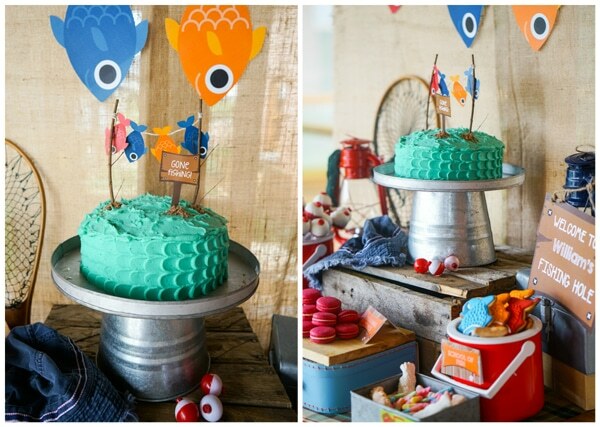 I used hessian for the backdrop and large fish bunting – we just used double-sided tape to attached the fish to the string and the fish to the hessian. Oh glorious double-sided tape – I don’t go anywhere without it! Aaaah the fishing party favors! 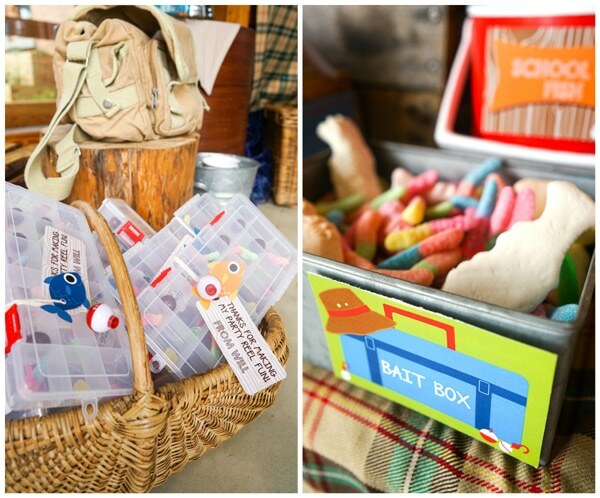 These tackle boxes were so much fun to put together and the kids went “reely” mad for them. Each of the 18 little compartments were filled with one sweet and then the box was wrapped with string, fish and thank-you tag as well as these miniature red and white bobbers or floats or whatever you want to call them. Either way, they are too cute! We made little canoes to hold some candy “oars” – the canoes are printable and we just used a glue gun to stick and assemble. A friend lent me an old picnic basket and I used it to accent the front of the table together with the rope peeping out and the “Gone Fishing” sign. 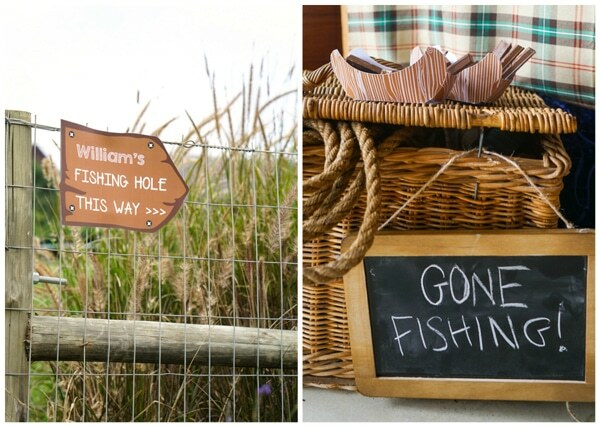 What an Adorable Boys Gone Fishing Party! What’s your favorite detail? Let us know in the comments below! This feature contains affiliate links. Please read our full disclosure policy. Shop these adorable party products that were hand-picked by our editors! 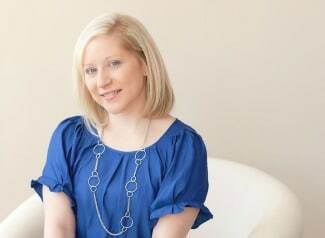 Check out these other fun parties on Pretty My Party!